Transformers: Comvoy no Nazo is a 1986 Nintendo Famicom video game by Takara based on the popular toyline and television series, Transformers, and released only in Japan. The title translates to Transformers: The Mystery of Optimus Prime in English (Optimus Prime is known as Convoy in Japan). The game stars Autobot protagonist, Ultra Magnus, as well as a select group of Decepticon villains such as Starscream, Megatron, Menasor, Bruticus, and Trypticon. 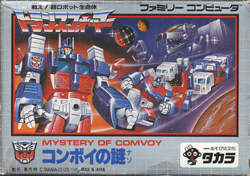 The box and the cartridge label for the game reads: "Mystery of Comvoy". This would be a mis-romanization of the Japanese name for Optimus Prime, "Convoy". The titular "Mystery" is the identity of Optimus Prime's killer. In Japan, The Transformers: The Movie was not theatrically released and thus Optimus Prime's death wasn't adequately explained to the Japanese audience; this game was intended to capitalize on that gap. Like other popular 1986 platformers such as Super Mario Bros. 2 (known outside of Japan as Super Mario Bros.: The Lost Levels) and Atlantis no Nazo, this game is considered extremely difficult, unfortunately due to its poor programming. Enemy projectiles move extremely quickly and often blend in with the background because of their small size, and are notoriously difficult to dodge. Also, it takes far too much time to transform Ultra Magnus into a truck and back, which leaves him open to enemy hits. Because of this, many have trouble even completing the first stage. The game is incredibly difficult to finish, as the ninth level of the game is a maze that must be completed in an extremely specific pattern or else it will loop infinitely. Along with poor graphics and level design, Transformers: Convoy no Nazo is a very poorly received video game. Despite the poor reception, the game was selected as one of the Famicom titles to revive for the Wii Virtual Console in Japan. It was made available for download on May 30, 2008. It was also highly requested by many people to be featured in a DVD Special episode of the Japanese television show, GameCenter CX (known outside of Japan as Retro Game Master), which was seriously accepted by the show's staff. Ironically, the animated Transformers Movie was initially only released in the United States. The movie details the final epic battle between Optimus Prime and Megatron, during which Optimus sustained fatal injuries. As a result, he passes the Autobot Matrix of Leadership on the Ultra Magnus before passing away. The cartoon series that followed picked up where the movie left off, and was aired in both the United States and Japan. However, since the movie was not yet released in Japan, the Japanese audience was left to wonder about the fate Optimus Prime (or Convoy as he is known). This is the premise of the game, in which Ultra Magnus goes on a solo mission through various Decepticon strongholds to find out exactly what happened to Optimus. Flyer back, featuring the solution to the final level of the game. This page was last edited on 19 May 2010, at 18:24.